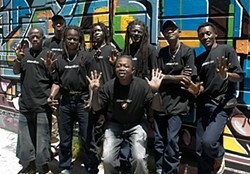 Sierra Leone's Refugee All Stars. Photo by Jane Richey. The title track of the Sierra Leone's Refugee All Stars record boils it down: "Living like a refugee is not easy." That's an understatement, especially when you look at the life of someone like the group's young rapper/drummer, who calls himself Black Nature. He's no longer a refugee, in fact he's currently living in San Francisco working on an exciting new project, but he took time to relate the story of how he left his home in Freetown, Sierra Leone, and narrowly avoided life as a child soldier. "Basically, it started when the rebels took over the city where I was living with my family. My dad got killed in front of me and I had to be with the rebels for a little while," he recalled. He's not sure how old he was at the time. "I wasn't keeping track of my age because it was a difficult time for me, but I guess I was around 11 or 12. "I had the opportunity to escape from the rebels and traveled on foot for weeks and weeks in the bush, just trying to find my way. I finally found myself in the neighboring country, Guinea. I had never been there, and did not know where I was going, but I found myself at the border." Arrested while crossing into Guinea, he was thrown in jail, then sent to a refugee camp where he says, "They did not treat us like human beings... We lived in tents and had to sleep on the floor on mats; there were insects and scorpions and animals. In the daytime it was hot as hell, and a lot of people lost their lives because it was so cold at night." Things improved when he met Reuben Koroma, a teacher at one of the camps who'd managed to bring in a guitar. "He'd met an old guy called Franco [Francis Lamgba] and they played music together, playing music from the country," mixing African styles like the jazzy Sierra Leone gumbe with reggae. Black Nature became the drummer playing a homemade drum kit and the band became something like a family. "They embraced me and gave me work to do and food to eat. I became like a son to them," he said. The band stood out in camp; they provided respite. "People would come around when they heard the guitar sound. The music would let the people forget their trouble and trauma and interact and dance." Eventually a crew of Canadian filmmakers came to the camp, saw the band, and shot a documentary telling their story. Recordings and tours followed and the Refugee All Stars went worldwide. "It was pretty awesome. We were not really thinking something like that would happen," said Black Nature. "We were making music for the people, to help our brothers stay away from their trauma and forget. We were just doing it out of love. That was pretty much it." While he has escaped life as a refugee, Black Nature and the band have not forgotten where they came from. They've been working with the nonprofit refugee rights group Nine Million (an estimate of how many refugees there are now) and, most recently, Black Nation has been in California living with filmmaker Banker White and helping jumpstart WeOwnTV.Org, a media project that puts cameras and recording gear in the hands of young Sierra Leonean war survivors. This week he reunites with his old family, SLRAS. 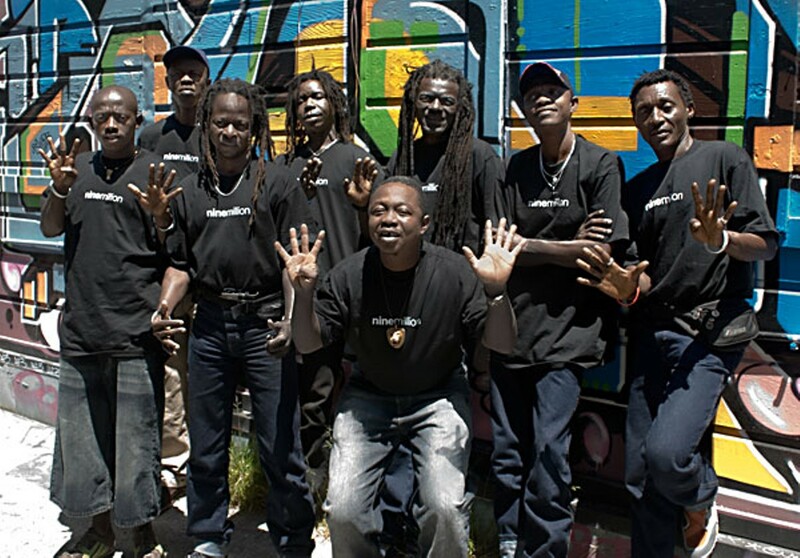 They're flying in from Sierra Leone for a tour that takes them up the West Coast, including a performance on Sunday, June 14, at Nocturnum. Give them a listen. They'll help you dance away your minor troubles, such as they are. It was a Sunday night, the end of a long, hot Reggae weekend. I was ready to call it a day and head home; but when I heard the strains of Third World's anthem, "96° in the Shade," I couldn't leave. And no, it's not a song about the SoHum weather; it's a strong story about the fight against oppression. The self-proclaimed "Reggae Ambassadors" formed in the early '70s led by keyboardist Michael "Ibo" Cooper and guitarist/cellist Stephen "Cat" Coore, both from a band called Inner Circle. It was 30 years ago when they put one-drop on soul and scored a hit with their cover of The O'Jays' "Now that We Found Love." They're still going strong, and Friday Third World kicks off People Productions' Sounds of The Summer '09 with a show at Nocturnum. SoulMedic from Lion Camp has a set before the 3rd Worlders. Selecta Prime spins before and between. The top-flight jump blues band Rick Estrin and the Nightcats plays Saturday at Humboldt Brews. Who? you might wonder, remembering the name as Little Charlie and the Nightcats. It takes a little 'splaining. Guitarist "Little Charlie" Baty formed the band way back in 1976 with harmonica player/vocalist Rick Estrin, a dapper retro cat with a pencil-thin mustache and a suave manner who was the front man onstage, principle songwriter for the band and basically Charlie's equal partner from day-one. Last year, after 30-some-odd years together, Baty announced his semi-retirement: He'll only play with the Nightcats at select gigs: big festivals and well-paying Euro-tours for example. Estrin's not ready to quit the road, however, so the band has been rebranded as Rick Estrin and the Nightcats with Norwegian-born guitar wiz Chris 'Kid' Andersen taking over on guitar. After moving to Cali a few years back, Kid played for saxophonist Terry Hanck, then took the lead guitar chair in Charlie Musselwhite's band; that was when he wasn't fronting his own band. Stepping into Little Charlie's shoes is a daunting task, but I'd say he's up to it. As he notes on his MySpace, "Good thing I'm a size 14." Matty of World Famous describes the show he's bringing to the Red Fox Thursday, June 11, as "transcendental electronica." The headliner, a Brit called Ott who's worked with Brian Eno among others, creates psyche-dub soundscapes and releases them on Twisted Records. He's touring with Pitch Black, two guys from New Zealand mixing live production with tripped-out projections, again all on the dub side. Then there's Chris Richards, aka Etheric Double Soundsystem, a loopy laptopper from up north who records for Space Gnome Records and has been working with Dr. Israel and Apostle from Heavyweight Dub Champs (among others). Matty promises a "really epic" night, "the electro show of the summer." This is the second Friday in June, which brings another Arts! Arcata with music and art all over town. Normally you could check out the whole schedule in the Journal to see whose art is where and what bands are playing, but not this week. Due to circumstances beyond our control, we didn't get the data in time, so no map, and only this bit of abbreviated list-age (mainly venues with music): You'll find The Fabulous Bluejayz in the Jacoby Storehouse lobby; art upstairs. Blue Lotus plays jazz at Arcata Exchange and they have bird sketches by Carl Meyers. Libation has Duncan Burgess on guitar with digital photography by Jesse Hughes. Hunter Plaid has alt. music by Mt. Mountain; new works by Scott Eddington. Clean Livin' plays bluegrass at Bubbles (as usual) and Weather Machine jazzes it up at Café Brio (again as usual). And, please forgive the blatant self-promotion, but, last but not least, I have a photo show at Missing Links Records. The fine uke etc. band Papa Houli and the Fleas will be playing music (outside, weather permitting). It's pretty casual, but M.L.R. Matt gave it a grandiose title when he made a flier: "Life and Music: Photos by Bob Doran." The life part means some arty stuff shot on various journeys and at least one hard news pic. Since it's a record store there are lots of photos of musicians, including a collection of small portraits of defunct local bands. The challenge: Name as many of them as you can. Whoever identifies the most will win an as-yet-undetermined prize. I hope to see you there.